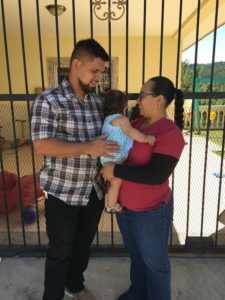 Please Welcome Our First Honduran Foster Family! 04 Dec Please Welcome Our First Honduran Foster Family! Just days after Thanksgiving we celebrated as our first Honduran couple signed their paperwork to become a Legacy of Hope foster family. Dra Maria and her husband, Lennar, joined our growing registry of foster families as they accepted a placement from our transition home. Sweet Karina who had been waiting over 3 months for a foster family took one step closer to permanency. Little Karina came to us the second week in August. Her mother who suffers from mental illness was unable to care for her, and Karina had been living for more than a year being passed around to various neighbors, each doing what they could to care for her but none able to provide her with permanency. When children and youth services became involved, they removed Karina and placed her in our crisis care center while they began an investigation. When she arrived, Karina could sit and crawl but was not yet walking. During her time in transitional care, she learned to walk, eat with a spoon, and say some new words. Also during that time, children and youth exhausted all searches for family members and asked if Legacy of Hope would find a foster family for Karina. Providentially, the very same month that Karina came into care, the Lord was starting to move in Dra Maria’s heart in regards to foster care. Maria’s family has always had a heart for the orphan. She recalled as a young girl that each week Maria and her mother, a social worker, would go to the movies expectant to enjoy the time together but also to see how God would allow them the opportunity to minister to a child from the streets. Maria remembers that the first child who would approach them to beg for money would be invited into conversation and then to enjoy lunch and a movie with them. That legacy of inviting relationship and showing love to children from hard places has carried on with Maria and her husband as they first partnered with us to offer affordable medical care to Legacy of Hope children, and now through this new chapter of their lives. After making the formal decision to become a foster family, Maria and Lennar collected the necessary documents to complete the process. Each Saturday Dra Maria would arrive at the ministry for her clinic hours to treat children in our care, but also during this time, she began to develop a relationship with Karina. One night she dreamed about Karina, and she knew that God was calling her family to foster this little girl. Legacy of Hope provided donations of diapers, wipes, clothes and a crib to Maria and Lennar. They went home and spent a week decorating the room and painting the crib to look like new. Maria painted Karina’s name on the wall and made beautiful paper flowers to adorn the space. 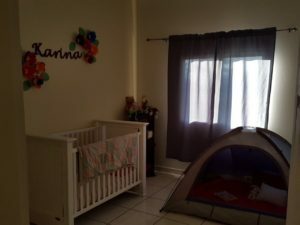 Lennar put together the crib and gave it a fresh coat of paint. 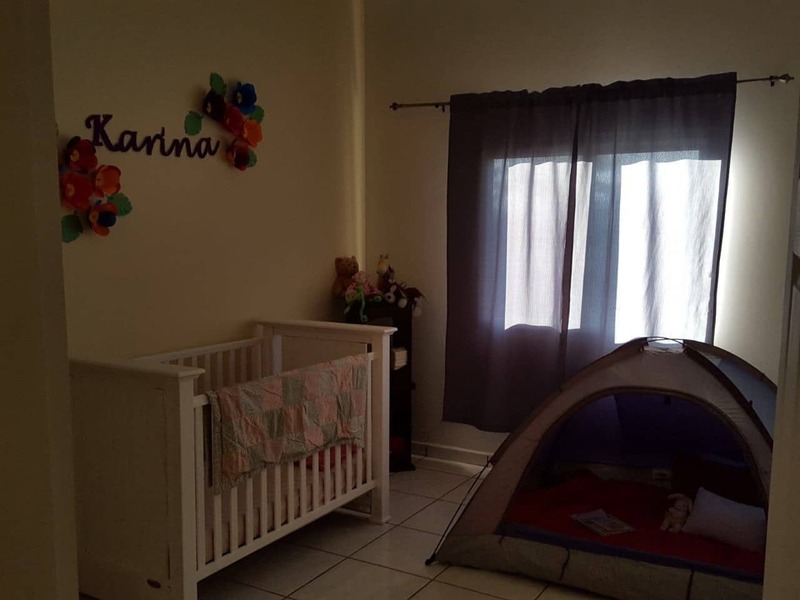 He assembled and placed a small tent filled with books and blankets inside Karina’s new room. Together they embraced the plan that God had for their stories to be intertwined with Karina’s and looked forward to welcoming Karina into their home and their family. This amazing family knows that God is still writing Karina’s story and believe that He will use her to do something great in Honduras. 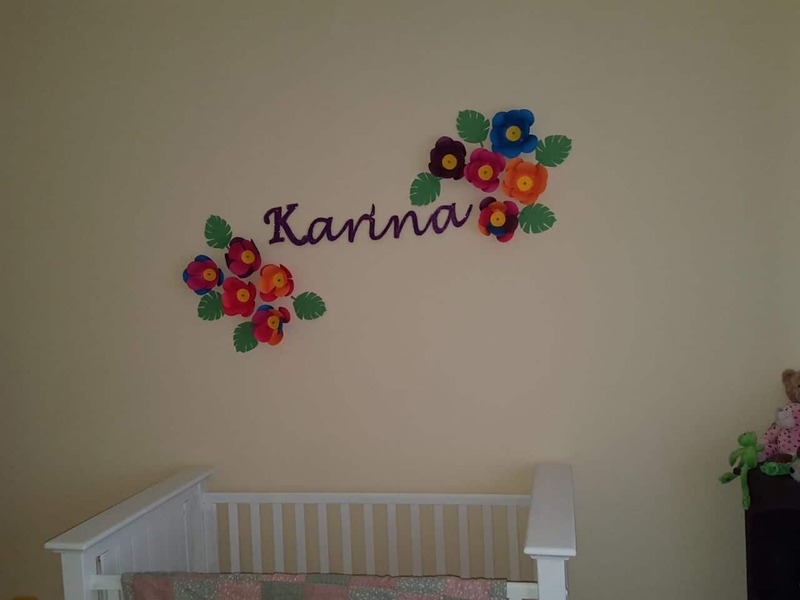 As they researched her name, they learned that Karina means beloved and they are certain that each person who meets her will see how much she is loved by her heavenly father as well as her earthly foster family. They are praying that her placement within their family will spark a movement to set the church on fire to stand in the gap for orphaned and vulnerable children. At Legacy of Hope we are overwhelmed by God’s goodness as he begins to make space in the hearts of new foster families and to change the culture’s perspective toward caring for a child who is not a family member. 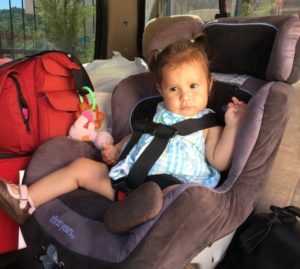 Tears filled our eyes as Maria and Lennar loaded the car and buckled Karina into her new car seat. They were all beaming, and the blessing and joy of a family was so apparent. They are a shining example of how a family can be created when we demonstrate the heart and unconditional love of Christ. We are overwhelmed at God’s goodness with the opportunity to serve children and families in this way and celebrate with Maria and Lennar’s extended family as they all welcomed her home.